I always have a stewed or puréed fruit of some sort in my fridge each week, whether it’s rhubarb, apple, berry or plums, for example. I pack my daughter Pearl off to school each day with a homemade flavoured fruity yoghurt. Pearl loves to help assemble it and has fun creating colourful layers. Once in the habit, it’s an easy and delicious tradition to keep up. This is a version of that but with the addition of oats to make it more filling for breakfast. Enjoy this as a healthy treat or dessert at any time of day. Stir in the apples and orange zest and juice together in a small pan. Pop a lid on and cook over a low heat for 3 to 4 minutes, until softened. Meanwhile, place all but 4 of the blackberries in a small pan with the cinnamon and 1/2 teaspoon of water. Cook on a medium heat and crush with a fork as they begin to soften. Simmer for 3 to 4 minutes, until the mixture thickens. Remove and leave to cool completely. Stir the stewed apple until smooth and remove from the heat. Leave to cool completely. Add 1 or 2 teaspoons of honey, depending on your preferred sweetness. Now for the assembly: toss the oats and hazelnuts together in a small bowl. Sprinkle half of it in the base of 4 x 125ml glasses. Next, spoon half of the yogurt between the glasses. 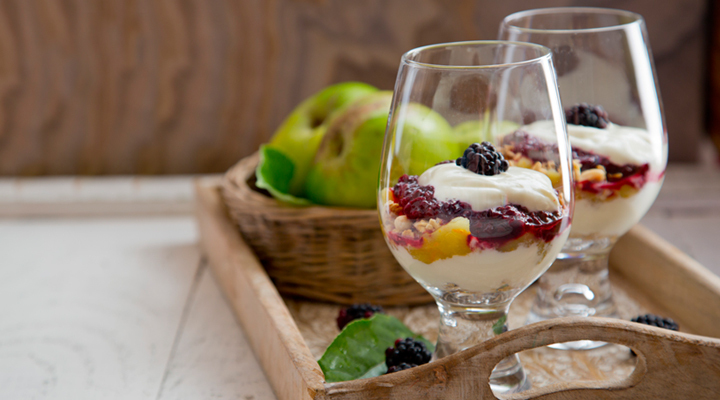 Divide the stewed apple evenly between the glasses, then top with the remaining oat mixture, the blackberry purée and finally the remaining yogurt. Top each one with a reserved blackberry and serve. Tip: You can prepare the fruit layers up to two days in advance, ready for a quick assembly before serving. These can also be completely assembled the night before, giving you no excuse not to have a delicious and nutritious breakfast in the morning.